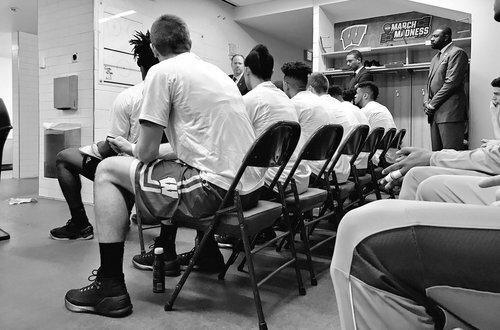 Let's go, @BadgerMBB fans. ???? Getting ready to drop the puck. Finally. 3. In last 20 years, only 2 coaches have gone to Sweet 16 in their first 2 seasons as a head coach: Few & Lavin. Is Gard next? 2. ???? Back in Red ???? So #Badgers give up a hoop, turn it over and then foul. #Badgers Brown energized early -- a 3 and an offensive rebound. Vitto working hard early. Grabs the offensive rebound. Leads to FTs for Nigel. Very good opening 3 minutes for Vitto Brown. Not sure 'Nova has anyone who can match up with Happ one-on-one in the post. Great start for the #Badgers , who lead 9-3 at the first break. Happ with 4 for UW, which has six points in the paint. #Badgers sharp early on both ends + have a 9-3 lead with 15:29 left. UW 4-5 shooting. Brown 3 pts, 2 boards, 1 assist. Timeout on the floor. Wisconsin up early 9-3. Looks like the team we saw in the 2016 half of 2016-17. Villanova 1 of 3 from the field with three turnovers in seven possessions. UW 4 of 5, no turnovers in six possessions. Nine unanswered for the #Badgers , who are 4-for-5 from the field to start. Ethan Happ with 4pts, 2stl & 1ast. That's the start the #Badgers were looking for. Up 9-3 and playing well on both ends. Nova won't keep turning it over like this, though. Should mention that Showalter moved to Brunson and Hayes took Hart after Nova made some substitutions. Trice and Iverson in for Brown and Koenig. #Badgers Gard upset with Trice not blocking out there. Trice picks up two quick fouls in back in comes Koenig. Happ picks up his second foul at the 11:49 mark. UW up 12-10, but that's bad news. Tough call on Happ to get second foul - 11:49 remaining in the half. 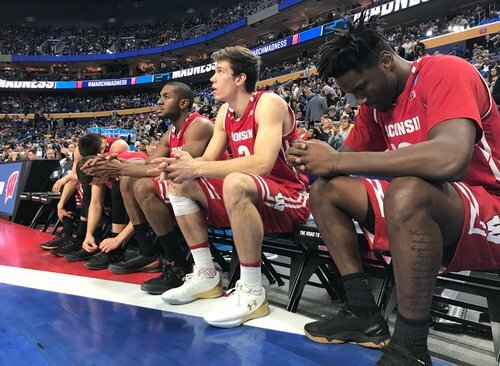 #Badgers Happ gets his second foul, with 11:49 left. UW staff wanted a charge before that contact. The #Badgers have turned the ball over on three of their last four possessions. Four total in 12 possessions.